There are a lot of luscious choices at ClickerExpo, so how do you choose wisely? Perhaps the single most important thing you can do is to set simple goals. Even simple goals help you get the most out of Expo decisions, because you eliminate what’s extraneous and focus us on what helps meet your goals. Interested in seeing as much of Ken Ramirez as possible? Easy. You can identify his courses quickly and set up your schedule to include them. Want to get a solid grounding in clicker training? Easy, look for the Foundation-level courses. Want courses in particular topic areas like dog-sport competition or teaching others? That’s easy, too. Every course has an associated topic area, such as Competition, Aggression and Behavior Management, Teaching, Skill Development, Science, and more. Still need more help? Glad you asked, check out our guide to choosing courses. 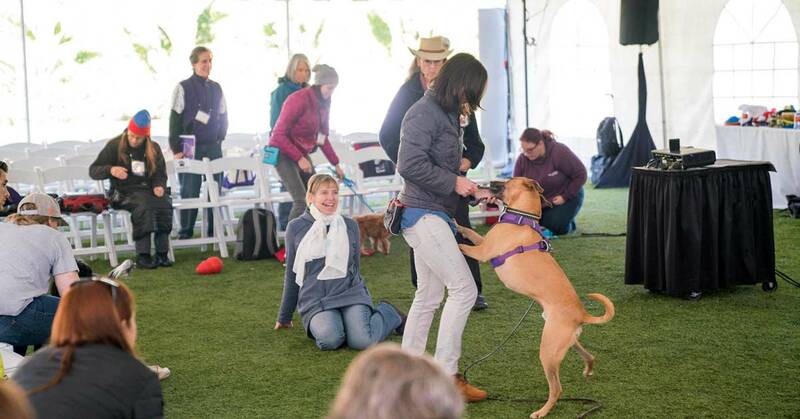 For example the Learning Lab with Sarah Owings, Right On Source - Clicker Training and the Nosework Team - In Action!, has a Session that precedes it. If you are participating in a Learning Lab, be sure it’s a good fit! The description header of the Lab will detail the kinds of solid skills or behaviors you and your dog will be expected to have in order to participate. For example, here is the header to Hannah Branigan’s Precise Heeling Deconstructed - In Action! We will have approximately 10 dog/handler teams. Teams should be clicker-savvy and have experience with both front-foot and full-body platforms. Dogs should have fluent chin and nose target behaviors with at least 3 seconds of duration, and experience with rear-paw targeting. Dogs must be experienced working successfully in a busy group setting and in close quarters with other working dogs, even when excited. You may participate with your dog or you may attend as an observer. Observers should not bring their dogs to the Lab. When I plan to see a musical on Broadway, I listen to the music ahead of time. It helps me get an idea if I’ll like the style of the show. Likewise, you can do pleasant research on the writing and teaching of the ClickerExpo faculty members. Watch some of their videos or some of their past presentations at ClickerExpo, or read a book that they’ve written. With this preparation, you will get a sense of different faculty members’ ideas and styles, which can help you plan your schedule and choose courses. Of course, you can always just go with the “Surprise me!” method, too! 4. Life’s Better Shared, So Share! Don’t get me wrong, I enjoy my “alone time,” but I love when others share great experiences with me. When you share you can talk about what you have heard, what you learned, and your interpretation of a new idea. Plus, if you are bringing a dog to ClickerExpo, it can be fun for both of you, but it is also a commitment to put your dog’s needs first. If you are at Expo with a friend, s/he can help you out with your four-legged friend (and vice versa! ), which is all the better. Remember, you have a referral code you can give to any first-time attendee, that when applied rewards you both. Learn more about the Refer-a-Friend Program. You can’t possibly see every speaker and attend every Session or Learning Lab you think is going to be great, but you will see great ones all the time. If you become “at one” with that, you’ll be what psychologists term a Satisfier, and you’ll appreciate your choices. Satisfiers feel really good about difficult choices. “Optimizers,” on the other hand, worry that they missed “the best” and that creates stress for them! What has worked for you? What would you share with others? Let me know! More help, if you need it! Find the best courses for you. Hi there — just wanted to make sure I understand: if we are simply an observer for a lab, it’s “okay” to miss the accompanying pre-session? I know that it’s certainly better to attend the session before the lab, and I plan on doing that, but ack! there’s always at least one session that conflicts with a prerequisite session 🙂 ! Hi Susan, If you are attending a Lab as an observer, we recommend that you attend the prerequisite Session as well, but it is not a requirement. However, as an observer who has not attended the prerequisite Session, we ask that you please refrain from asking questions during the Lab, as most questions were likely answered. Hope this helps! In regards to seeing every speaker, how long before the expo starts can we go into our registration and sign up to pay for the package of 40+ videos? For the best pricing, add Video On Demand to your registration by Thursday, January 3, 2019 for Portland or by Thursday, February 28, 2019 for Washington DC! Learn more about Video on Demand here! There are so many excellent courses to choose from, inevitably two you want to attend will be offered at the same time. Consider purchasing the video recordings that are made of most offerings – and eliminate the conflict. Also, get plenty of sleep before and during ClickerExpo – your brain will be busy and will need rest! First, remember your energy level. I no longer have the energy of an Australian Shepherd and have to plan some rest breaks in my schedule. Second, there is always next year! So your top two sessions are at the same time? Don’t worry. You can usually have the opportunity to see the same speaker again next year. And seeing the same speaker two years in a row can really help reinforce their ideas. I totally agree with Dawn. I had so many “mind… blown!” moments last year (my first ClickerExpo) that I was pretty exhausted at the end of the 3 days (although happily so)! I did much of the conference on my own but I loved loved loved the “topics” on the breakfast tables as a way to decide where to sit. I met some great people (bring and ask for business cards to keep in touch afterward). Listen to your dog. Just because you can register for 4 working spots in labs over 3 days doesn’t mean your dog can mentally or physically handle 3 days of dog seminars. Give your dog lots of down time. This year I purposely scheduled our labs for 2 days so we don’t end up leaving early because my dog’s brain is toast on the third day. Also, if you have a person with you who isn’t participating in ClickerExpo (my husband for me), give your dog breaks away from the seminar and/or hotel. Either a nice walk or a nap in the hotel room, depending on the dog, may be just what the dog needs. Just because we can bring our dog with us to lectures, doesn’t mean we should bring them to every lecture. Dog’s needs always come first, so plan around that. Great comments so far. Going in another direction, bring along a sweater/sweatshirt, favorite writing pen or laptop for note taking and snack/drink for the sessions. Practice excellent hand hygiene to help protect yourself and all your clicker friends from sharing unwanted germs. As for the Sessions, purchasing a video package is a great way to work around the issue of having more than one Session you want to see at the same time. This also allows you to revisit a Session that you may have absolutely loved, found challenging or were inspired by. Oh and leave some extra room in your suitcase for the purchases you will make at the store!!! !